See, I told you all that I would try to write more often. Slowly but surely I will get back into the habit of making time to write about the things that I am attempting to create. This time, I am here to talk about cat toys. 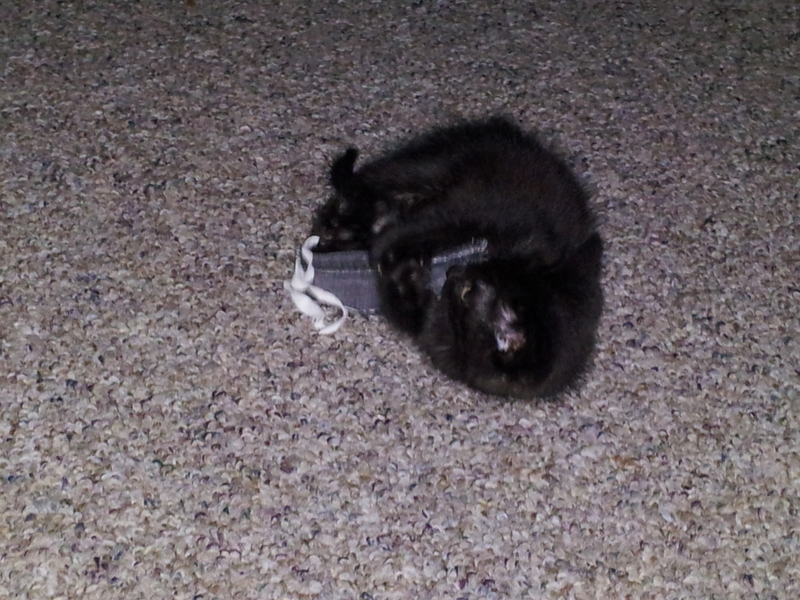 The kittens that we are fostering really like to try to hunt and “kill” whatever is around them. I decided it might be best to give them a lot of options that would be safe for them to destroy. I had a pair of jeans in my fabric stash that Mr. Uncommongeek decided to get rid of due to a rip that could not be repaired. Denim is a super rugged fabric that can be very durable. As noted previously, I also have a seemingly endless supply of stuffing. As a side note, should I decide to make more in the future, I also happen to have a supply of catnip that I am not using here, simply because the kittens are too young to really be affected by it. I cut out a bunch of small pieces of the denim. Then I sewed them in various ways. The kittens are very small, so I wanted to be able to have something that is small enough for the kittens as they are now, but also some bigger pieces for when they are older. Most of the shapes that I sewed were pretty square. 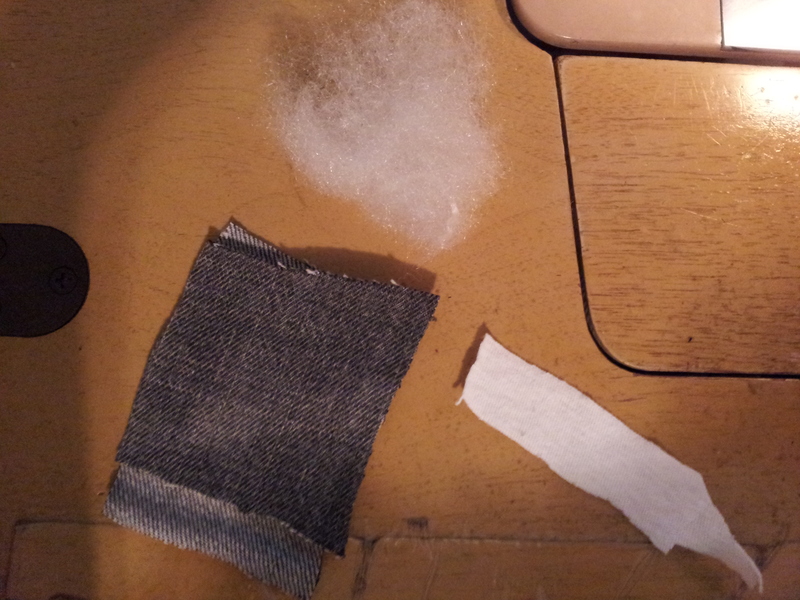 First, I sewed up 3 sides. 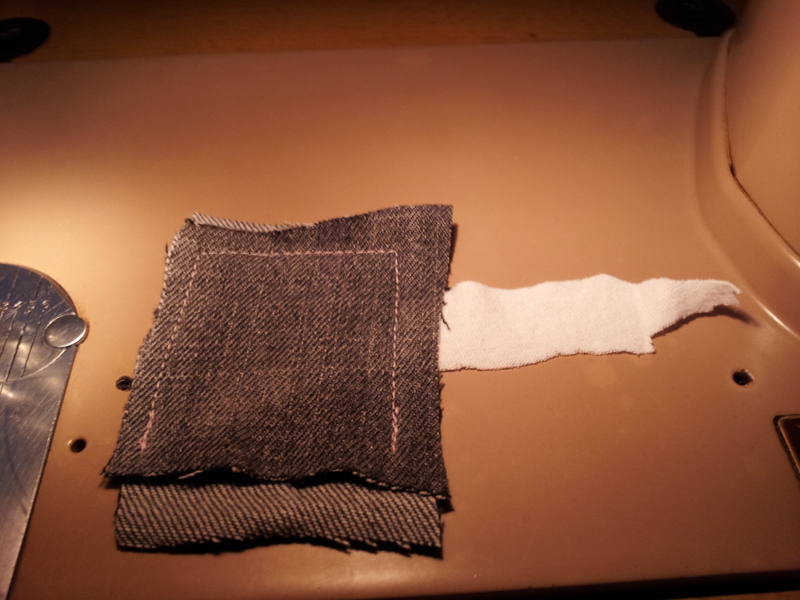 Then stuffed the pouch and sewed up the final side. I did the toys in two rounds to see which kind would be more popular of a toy. I like the look of the toys with the seams on the inside, but the kittens both seem toprefer having a flap of exposed seam to bite into. The exposed seam is also the side that they hold when they carry it around in their mouth. I also attached tails on the second round, just to make the toys more interesting. I decided not to add anything else because I definitely want to avoid any sort of choking hazard, or potential accidental ingestion. Hey blog sphere, sorry that I haven’t been taking the time to write to you guys. I will try to remedy that with a couple of posts coming up. 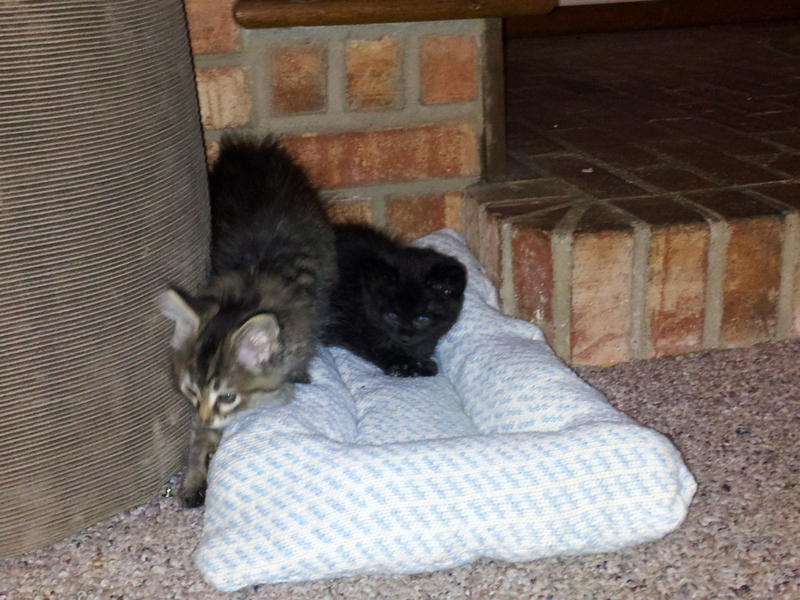 Mr. Uncommongeek and I have been fostering a couple of kittens. We were successful in finding them new forever homes, and I was able to use some fabric out of my stash to make things to go with cute little balls of fluff as they journey to their new life. One of the first things that I made is beds. I know that most cats love laying on soft things that they can curl up in, and if it resembles a box lid, then all the better. I also know that pet beds are super expensive and I don’t have that kind of money to spend on a cat who would probably turn their nose up at it anyway. A while ago, I had purchased a couple of sweaters either from Goodwill, or a local thrift shop, so I could make various craft things and stuff. Needless to say, the things that I was attempting to create didn’t work out so well, and I never tried to figure out what to do to improve upon my mistakes. Which left me with a bunch of sweater pieces. I also have all sorts of stuffing and blanket batting. I have purchased stuffing, but my friends and family are aware of my craft supply hoarding problem, and supply me with their surplus every time that they are clearing out their stash. I have been trying to utilize this surplus at every opportunity that I am able, but I feel like this is a substance that will multiply when you are not paying attention. 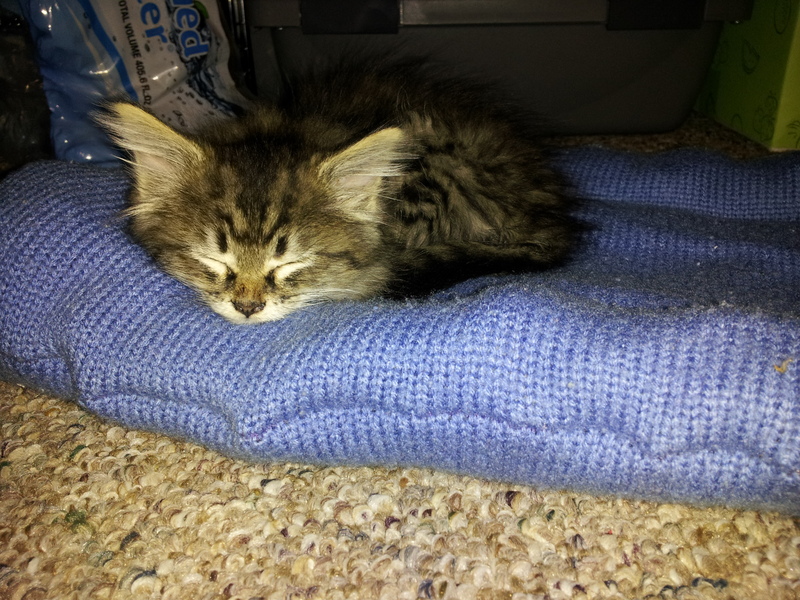 To make the kitty beds, I used a piece of sweater that had been cut off straight across below the arm holes. 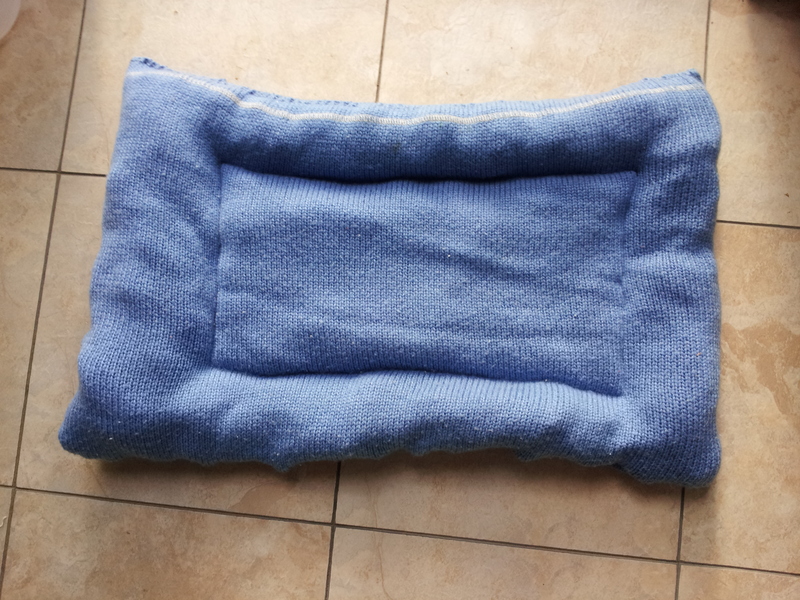 I then made sure that three sides were sewn up, leaving the bottom hem of the original sweater unsewn. I then cut a piece of batting to be about the size of the sewn sweater piece and placed it inside the sweater. 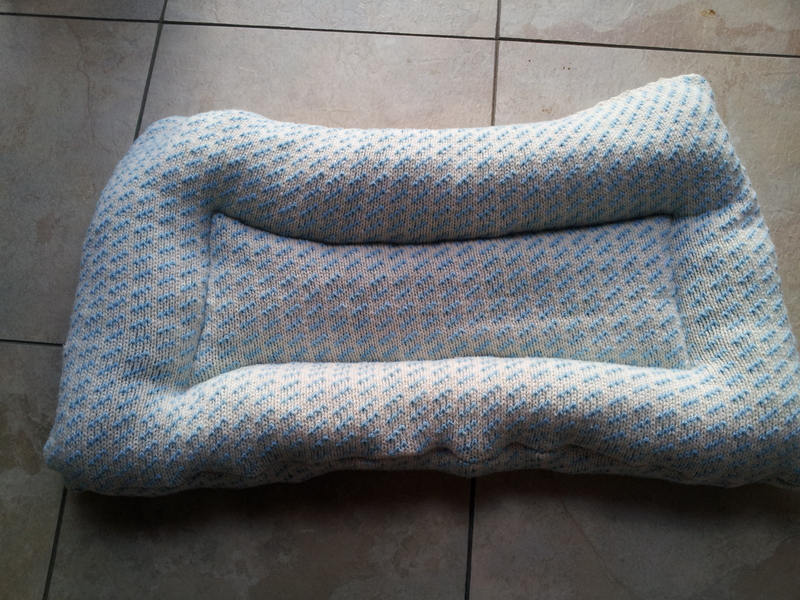 Then I sewed the middle part down to create a bed area and a side rail area. Next, I stuffed the side rail area with stuffing that I had on hand. 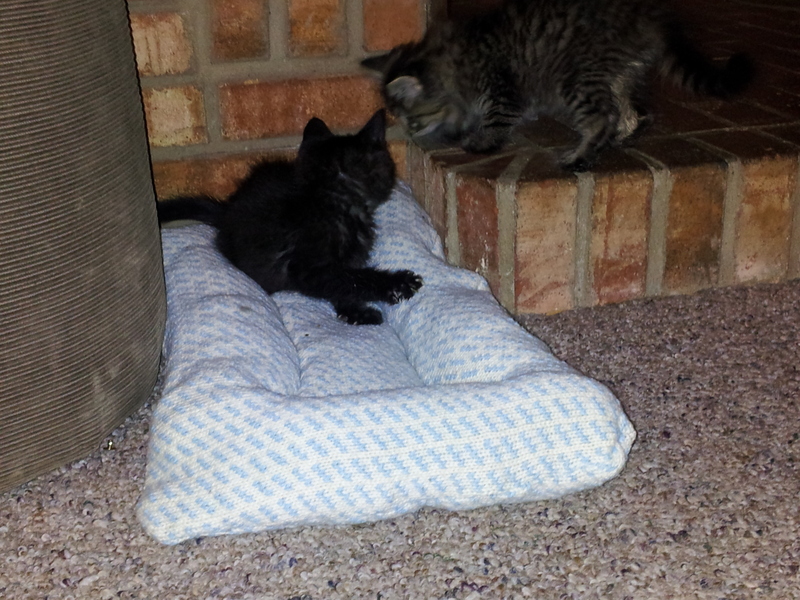 Once that was stuffed to my liking, I hand sewed up the last side of the bed and let the kittens choose which one they wanted. Overall, the project was pretty easy and I completed both beds in one afternoon. I know that they are not perfect, but it was my first attempt and I wasn’t really looking to make them perfect, just usable. The kitties seem to like them, and that is what really matters. I was inspired some time ago by Sew Weekly. For those of you who don’t know, Sew Weekly is a place where a new sewing challenge is posted every week and whoever wants to can participate. I fell in love with the idea and the people who were participating and knew that it was something that I wanted to do. It would be something that would both get my sewing skills up closer to where I want them to be and it would help me battle the jungle of crafting supplies that are taking over my living space. So, I waited till the new year and I signed up to join. Then, I found out that the person in charge of the everything was on hiatus due to a death in the family. Then life happened for me as well and I stopped even trying to pretend to try to complete any of the challenges of the previous year. Now it is 2014 and my crafting supplies are the thing in my apartment that is taking up the most space. Not my clothes, shoes, books or video games even come close to rivaling my craft cave in terms of size, variety, or let’s be honest, shame at owning. I have begun selling off pieces of what I own in an Etsy store, but it hasn’t yet made much of a dent. My mother is cleaning out her craft supplies and I am doing my best to make sure that my collection does not grow in response. I am trying to do the challenges again, even if they are now technically two years old. I am trying and that is the important thing that I am focusing on. You may be asking yourself now why I am posting about this in February. The answer is because I am really bad about taking pictures of the things that I made. I am currently trying to make sure that I upload the backlog of the things that I have already made so I don’t fall into the trap that I fell into before of not documenting, then not posting, then not making because I didn’t post the last three things that I made. So here’s hoping that I will do better for the rest of 2014.